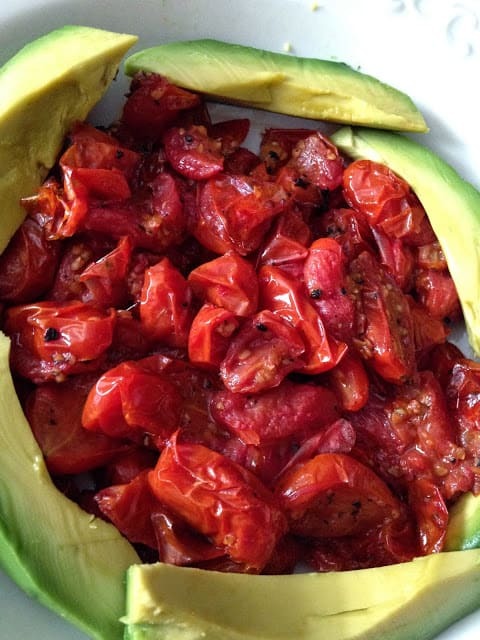 Roasted Cherry Tomatoes are delicious served with sliced avocado and cubes of mozzarella cheese or crumbled blue cheese. This simple “dish is for a great light lunch or side dish. Roasted vegetables have become our recent passion as of late and this recipe tops the list. Globe Tomatoes are medium-size, firm and juicy. They’re good both raw and cooked. Another variety is the Plum Tomato, also called Italian plum and Roma, a flavorful egg-shaped tomato that comes in red and yellow versions. Grape Tomatoes are baby romas. The small Cherry Tomato is about 1-inch in diameter and can be red or yelllow-gold in color. It’s very popular, both for eating and as a garnish because of its bright red color and excellent flavor. The yellow cherry tomato is slightly less acidic than the red, therefore somewhat bland in flavor. Though it’s long been popular raw in salads and eating out of hand, the cherry tomato is gaining favor as a cooked side dish. The Yellow Pear Tomato is slightly smaller than the cherry tomato and resembles a tiny pear. It’s used in the same way as the cherry tomato. Preheat oven to 400º Line a baking sheet with parchment paper. Cut each tomato in half, lengthwise, then place on prepared baking sheet. Drizzle with olive oil. Sprinkle with rosemary, salt and pepper. Drizzle with balsamic vinegar. Toss lightly. Arrange tomatoes on baking sheet. Roast for 25 to 35 minutes. Cool. 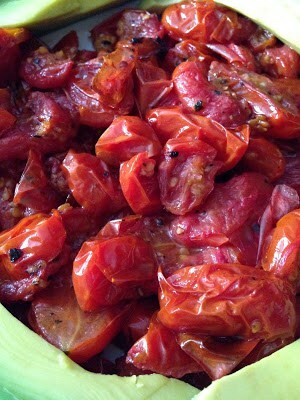 I love roasted tomatoes too and regularly buy them and forget to use them until they are wrinkly! These sound sooooo good! Great choice! Absolutely love roasted tomatoes! Great pick this month! Hi Lynn, roasted tomato… look good to me. Love the colour and thanks for sharing with us. Oh I love roasted tomatoes. The sweetness and intensity of flavour that comes from roasting them is just sensational. Yum… I'd love these on some fresh, crusty baguette! Those tomatoes would be good on so many things! How about a flatbread? Or cooked pasta? Or in a caprese salad? Simple, yet perfect! 🙂 Great pick – happy reveal day! 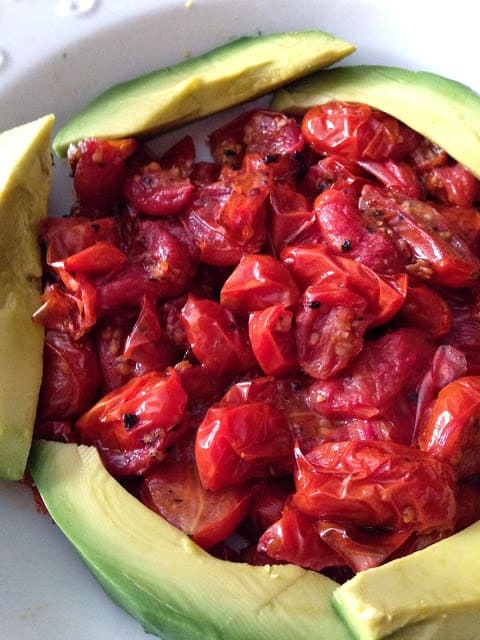 Roasted tomatoes are SO GOOD with avocados. Glad you enjoyed 'em! Hi Dena! Thanks for a great recipe! Can't wait to try your recipe for Haddock! Roasted tomatoes is a staple for me – something I always keep in my refrigerator to add to pastas, grains, and stews. Great pick! !